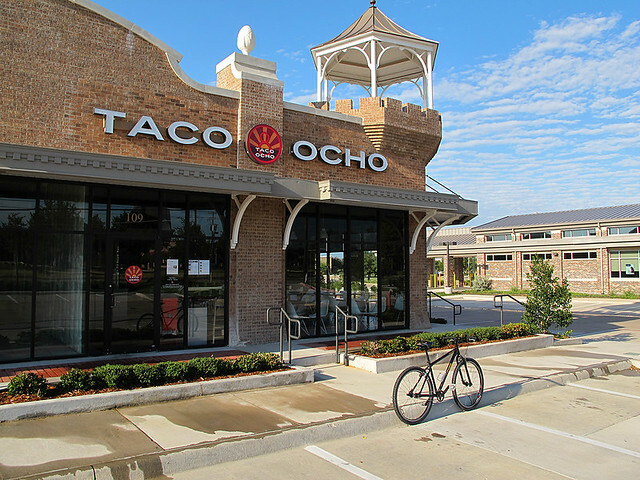 We’d like to introduce Bike Friendly Richardson’s newest partner, Taco Ocho. If you don’t already know who they are, check out their website. Taco Ocho, a Latin inspired fast casual restaurant, which opened in May 2011 in Richardson, has an unmistakable Mexican influence but also subtly embraces cooking styles and comfort cuisines from several Latin American countries. True to its name, Taco Ocho offers eight tasty interpretations of fresh and authentic Mexican/Latin favorites on familiar platforms – tacos, tortas and tostadas. Every item is made-to-order using the freshest ingredients and presenting its own distinctive taste south of the border. Taco Ocho opened on May of this year. They are offering a 10% discount to local bicyclists when they arrive by bike. Just ask the person about this offer when you place your order. This offer may change at the owner’s discretion. Please, help support our local economy and community. Went there for lunch. Very good. Did did not see a good place to lock up a bike, though. Went here for dinner last night and it was awesome. The tacos are huge and the dining room looks great. Paul, we locked our bikes up to the part of the stair handrail that’s parallel to the sidewalk. Not the best, but secure.